VetriScience® Laboratories, makers of GlycoFlex®, is proud to announce the release of its latest product: Entero Health Pro, an advanced supplement to help support long-term intestinal health in dogs and cats. Entero Health Pro may also help manage recurring diarrhea. Announcing Entero Health Pro. A new way to support G.I. Health in pets. VetriScience® Laboratories, makers of GlycoFlex®, is proud to announce the release of its latest product: Entero Health Pro, an advanced supplement to help support long-term intestinal health in dogs and cats. Entero Health Pro may also help manage recurring diarrhea. Entero Health Pro is the newest addition to our veterinarian exclusive line of pet health products that provides complimentary alternative solutions to support traditional veterinary medicine. Over time, Entero Health Pro may help to normalize bowel function by supporting the protective layers of the GI tract, which can become compromised due to stress, illness, food sensitivity and environmental conditions. In a study (details available http://www.vetriproline.com) of Entero-Chronic® Blend, featured in Entero Health Pro, 85% of vets and pet owners saw positive improvement in dogs with chronic enteropathies who did not respond to traditional therapies. The product was announced at the 2016 North American Vet Community Conference in Orlando, Florida. On January 20th, VetriScience® sponsored a seminar with Dr. Sergei Segarra, DVM, who is in charge of Research and Development at Bioiberica’s Veterinary Division in Barcelona, Spain. Bioiberica is the producer of Entero-Chronic® Blend, and during the session he discussed in depth, the study which demonstrated the efficacy of Entero-Chronic® Blend. 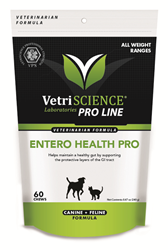 Entero Health Pro is the latest in VetriScience’s Pro Line, a line of products designed exclusively for clinical recommendation and use. At VetriScience® Laboratories, our mission is to provide veterinarians with powerful products backed by science to complement traditional therapies. We are committed to using pure and highly researched ingredients in products that are safe, effective, and developed by vets for vets. Visit http://www.vetriproline.com for more information.